The weather is starting to cool down over here and I'm not pleased. We had a gorgeous few days of Indian summer last week, but it is time for me to come to grips with the idea that Fall is here, and here to stay (well atleast until winter rolls around). This is the time of year when I am very happy that I have beautiful beach and tropical photos to scrapbook. Just looking at them makes me feel warm. I think I'll be keeping this particular page hanging over my desk until May next year. 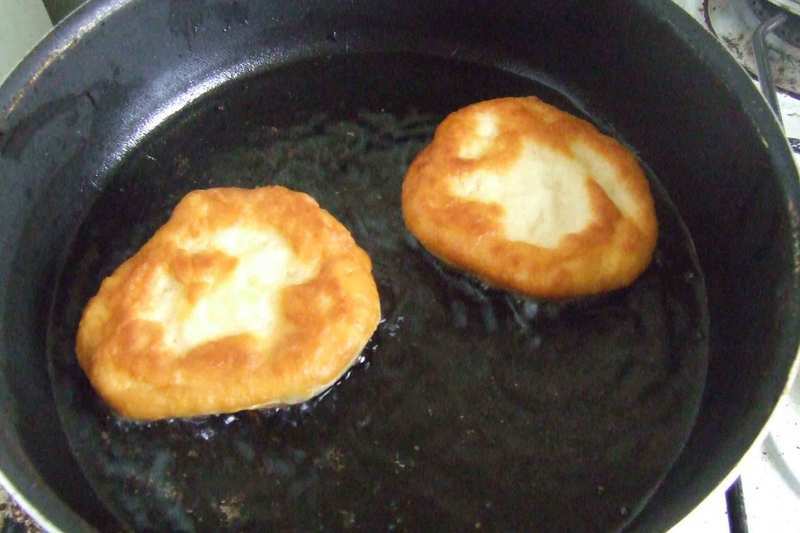 Today I had an incredible urge for a West Indian favourite: fry bakes. The dough for these delicacies are simply made from flour, baking powder, salt and warm water, then fried in vegetable oil. Healthy? No. Delicious? Very much so. I quickly prepared a batch in around 15 minutes. And of course I ate them steaming hot, dripping with melted butter and stuffed with cheddar cheese! The rugged east coast of Barbados. There's nothing like being on a beautiful Caribbean beach to turn you into a child again. My husband Lucas didn't go to the beach much when growing up, in fact when we met he told me that he didn't like the beach at all (which gave me a serious moment of pause, being such a beach baby myself). Having been to the beaches on the coast in Marseille I totally get it now. Luckily he changed that tune after his first "real" beach experiences in Grenada and Barbados about two years ago. 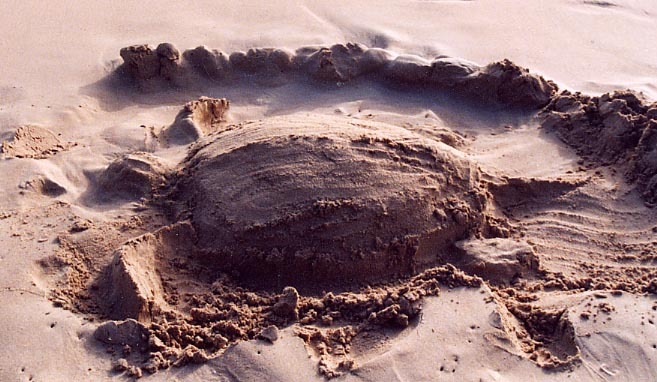 So we decided to build a sand castle that day. 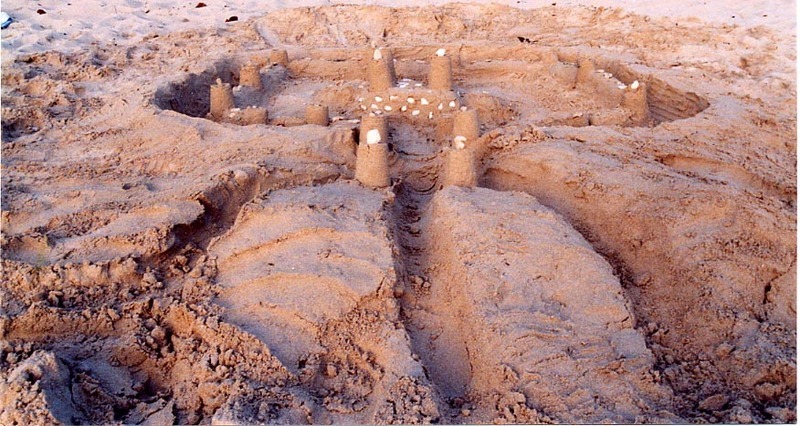 No doubt the other beach-goers were extremely amused to see two grown adults scrambling around the sand, using a plastic drinking cup for a mold, and seriously discussing how our castle should look. Lucas also decided to sculpt a sea turtle. It was the best fun I'd had in ages. Ahhhhhhh, the simple pleasures in life! I lived in St. Lucia for just under three years and one of my biggest regrets is not learning creole. 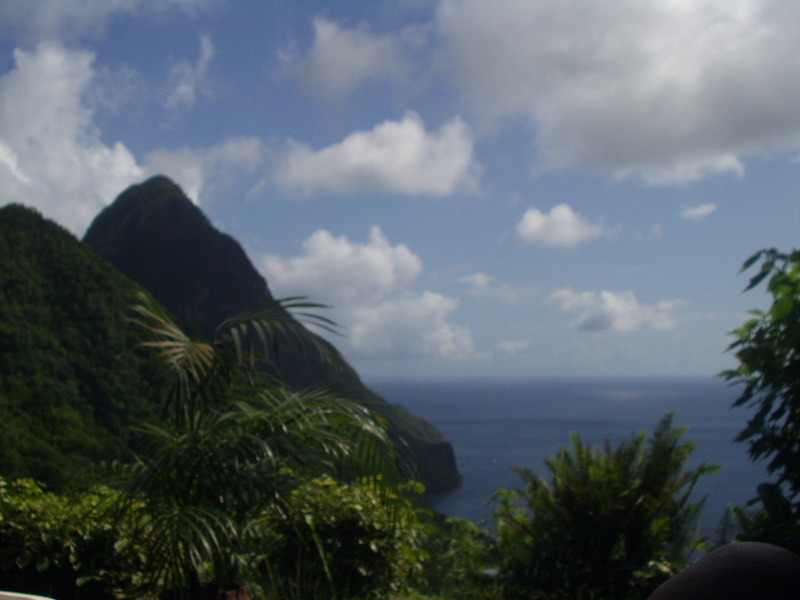 St. Lucia, like Dominica, Haiti and islands in the French West Indies, still has a vibrant creole or patois language. It is largely based on French, but also includes words from African languages as well as Dutch. In Grenada we still have vestiges of creole. Expressions like bun jay! (Bon dieu! = Good God! ), and tout bagay (every single thing), and the way we attach oui (Oui = yes) to the end of our sentences as in "It's hot today, oui". We tell ghost stories about the La Jablesse (La Diablesse = female devil) and sing our babies to sleep with Doh doh piti po po. I have memories of hearing adults in my gandmother's generation speak to each other in patois, they did that so that the children couldn't understand the subject of conversation, which sadly is the main reason it died out. So I was pleasantly surprised upon arriving in St. Lucia to see that creole was alive and well. I vaguely remember hearing Dominicans and St. Lucians using it when I was at the St. Augustine Campus of UWI (University of the West Indies), but that was really in the abstract and didn't register. But when you live in St. Lucia or Dominica you quickly realise that it's not at all abstract, it's a part of the daily life there. In fact, in some of the more remote areas some residents speak only creole and no English. Contrarily in Castries, the capital, at the time I was there, there was an association whose aim was to promote and revive the use of creole in the urban areas, because it was already starting to die out. The thing I found most remarkable was that even though differences exist in the versions of creole of these islands, the residents can easily communicate with each other. This is a definite advantage. Martinique is so close to St. Lucia, that on a clear day you can see the coast from Castries, and there is a regular ferry between the two islands. 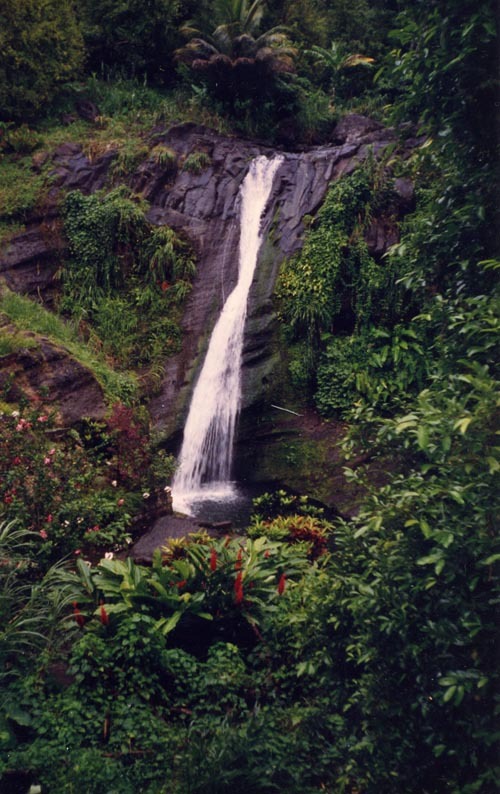 Guadelopue and Dominica are just a hop away. But even residents from Haiti, much further north, can communicate with St. Lucians, as I discovered while in the company of a colleague at the local market. He was walking around with a look of wonder on his face telling me "But I understand what they are saying." All the better since I didn't! sa ka fet = what's happening? After being challenged to do a scrapbook layout using the rainbow order of colours, I knew that only one of the ideas that came to mind would be perfect. I can't think of a better way to showcase the beauty that is our region of the world. I still struggle with scrapbooking photos realted to my heritage and culture. The answer? Just let the photos shine through, and forget all the frou-frou stuff. One of the advantages of living on a small island such as Grenada or St. Lucia, is that you can almost literally plan to spend a day driving around literally the entire island, stopping for sightseeing, lunch, and a "sea bath". This is best done with a bunch of like minded friends, not to mention coolers full of beer, soft drinks and other refreshments (some of Karen's rum punch for example). If possible, lunch should be a cook out on a beach somewhere (think curry goat, oil down or crab and callaloo), usually courtesy of the male members of the party. I have done this countless times in Grenada, it's practically required whenever we had "foreigners" visiting. A day like this that sticks out in my memory was in August 1993. Both my sister and I were "back home" for a few weeks visiting family, and some friends had visitors from the UK, then 2 of my friends flew down for a few days. It was inevitable, we had to go 'roung de islan'. We packed up food and drinks, and around 15 people in 4 cars and headed off along the western coast of the island towards Gouyave. The first stop was to the Concord waterfalls, shown here. I'd never seen it before that day and it was breathtaking! We also made a stop at Carib's Leap, visited a famous church in Sauteurs, and then had lunch at Bathway beach to the north. If I'm not mistaken instead of cutting across the hills to head back to St. George's, we took the longer route along the west coast. What I remember even more than the sightseeing was all the fun and laughter. Lots of Ole Talk as we call it - basically cracking jokes all the way. This is a very different look at the island as compared to the official tours or renting a car and doing it yourself. Typically, especially when there is a cook out involved, the itinerary will include one or more beaches that are well off the beaten track (as in you need a four wheel drive to get to it). Promise me if you're ever in Grenada and connect with any Grenadians tell them Francine says they have to take you roung de islan'. Not much gets prepared in our kitchen without a bit of nutmeg being added. According to a flyer entitled A Few Spice Recipes from Grenada, which we got when we bought spices there, "a pinch of grated nutmeg gives a delicious spicy flavour to egg nogs, milk drinks, rum punches, spiced hot wines, puddings and custards, salads, roasted lamb and sweet sauces". Very true. And also try adding it to quiches, apple pie, stewed peas, scalloped potatoes and just about any roasted meat. Whenever Lucas remarks that a meal seems to be "missing" something I reply "Add some nutmeg next time!" But beyond the nut itself, so much can be done with this versatile fruit. The soft yellow flesh that surrounds the nut can be used to make jams, jellies, syrups and liquers. Ground nutmeg is distilled to produce essential oil, which is then used in massage oils, lotions and other toiletries. The mace, the red lacy part that covers the nut can be used just like nutmeg itself and is excellent with seafoods. At Christmas Lucas discovered that he can use mace to flavour plain white vinegar, which is then perfect to go with foie gras. We also made nutmeg icecream a few months ago. Now I never eat icecream during the winter, but I couldn't resist that! Because we're such huge fans of nutmeg we were pleased when quite by accident we came upon the nutmeg processing plant in Grenville St. Andrew, and saw that they were giving tours. 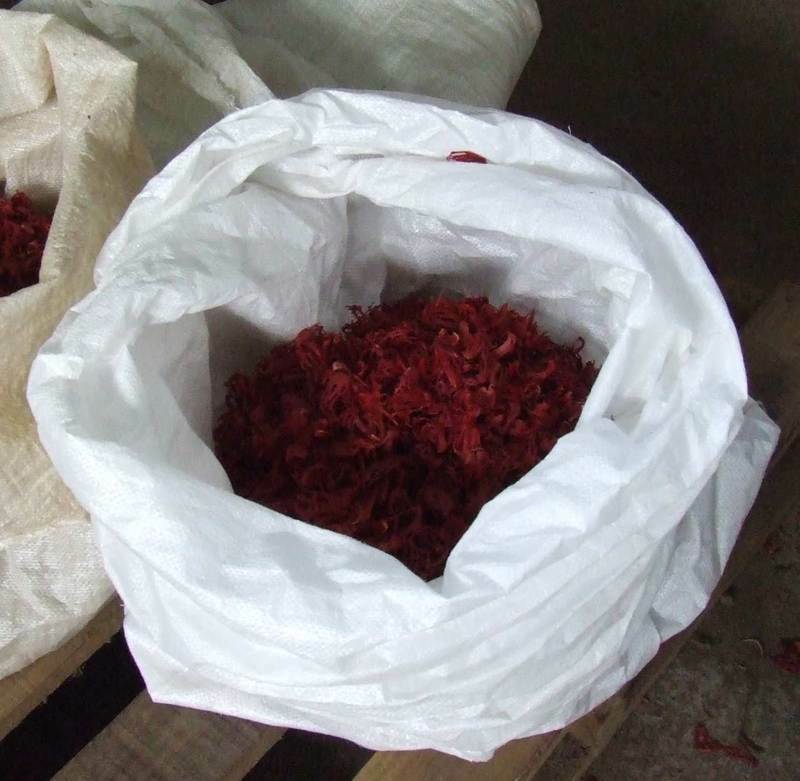 We were taken through the entire process, from the arrival of the nutmeg, their cleaning, separation and grading to storage and trasport. As enlightening as the tour was, it was also sad to learn that Hurricane Ivan, which struck Grenada in September 2004, destroyed close to 90% of the nutmeg trees. According to our guide, even though it takes six years for a tree to grow to maturity and produce a crop, it will take the island at least 20 years before it is back to its former level of production, which was around one third of the world's supply. We certainly hope that this will be sooner rather than later. It's funny what you take for granted, or rather it's funny what you never think about investigating. I grew up with the poetic names of beaches, villages and towns ringing in my head, never once occuring to me that they weren't English, that the way they were spelt and the way they were pronounced were so far removed from each other. Grand Anse, Morne Jaloux, Grand Etang, Sauteurs, Point Salines, Beau Sejour, Lance aux Epines, Requin..... the list goes on and on. One of the things that my husband Lucas loves about Grenada is that so many of the place names are French. Before becoming a British Colony in 1783, Grenada, like many other islands, was owned by the French, and the majority of names in French have stuck. While we were there last year he regaled us with the real meaning of many of the names of towns and villages. The most famous beach, Grand Anse, literally means large handle, no doubt because of its curved shape. Grand Etang? Large pond (this is the famous lake at the top of our one and only volcano). Sauteurs is the town on the northern coast of the island where in 1651 a group of Caribs, the indigneous people, jumped to their deaths rather than submit to the European settlers. The actual spot where they jumped is now called Carib's Leap. Well guess what? In French the word sauteurs means jumpers. This one clicked for me when I was telling Lucas this story last year. I'm not sure why when I was growing up I didn't realise this French connection. I don't recall it being mentioned in history class beyond the fact that we were once a French Colony (perhaps I just wasn't paying attention?) And at the time that I was attending the St. Joseph's Convent in St. George's, French was not offered, the only foreign language available was Spanish. This has since changed, as a number of my little cousins proudly demonstrated to Lucas and I on our visit. My only hope is that the French teachers see the opportunity right in front of them to engage their students, and step outside the boundaries of their assigned textbooks to make it a living language. 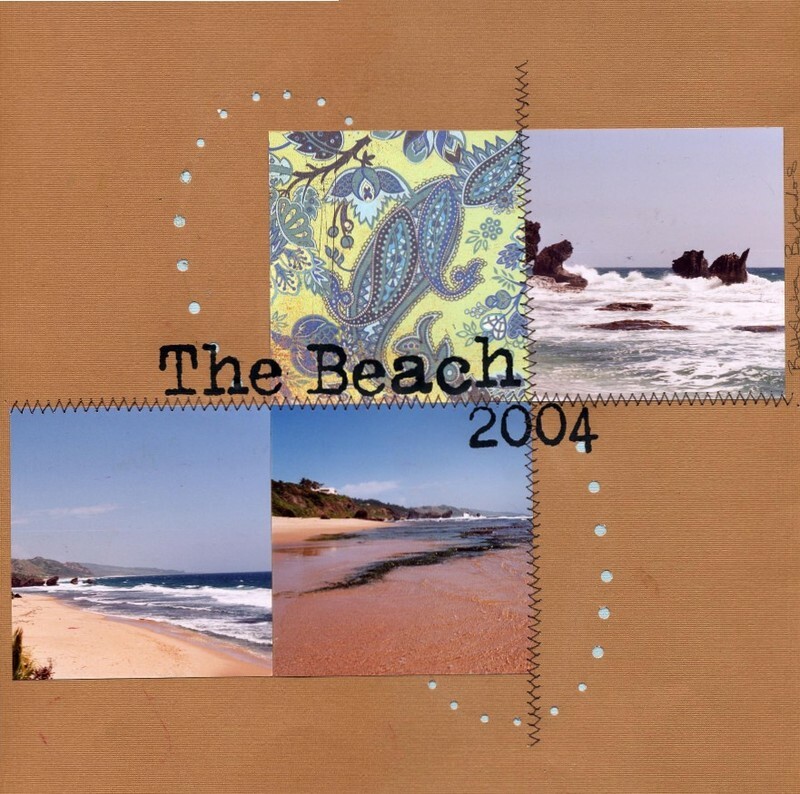 When the cold days, the grey days, the short days of winter seem like they will never end, all I have to do is put on my David Rudder CD and I am immediately back in the warmth, hearing the waves crashing gently on the beach. 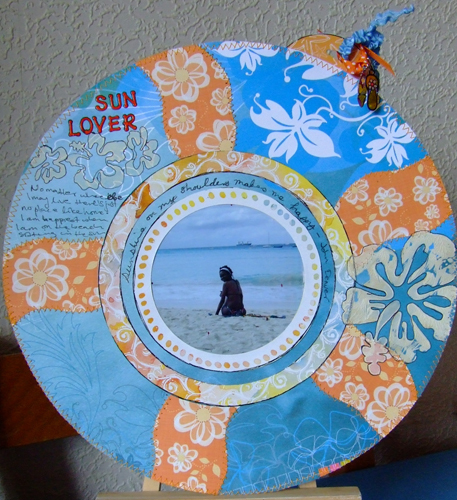 So says the journaling under the top left photo (the view from Grand Anse Beach, Grenada). It sounds corny but it's true. David Rudder never said a truer thing when he wrote Song for a Lonely Soul. The other photos were taken in Barbados (the bird of paradise) and Martinque (the fishing boat and the hibiscus). When I last listened to the CD, I toyed with the idea of doing a scrapbook page based on this song. So when I was recently challenged to create a page using the colours of blue and orange and including the lyrics from a song, I knew immediately that these photos combined with this song would be perfect. After looking at my photos from my recent trip home a friend remarked that I had more photos of scenery than of people, and that I'd become a real tourist! In a way this is true, but what I've realised is that living outside the Caribbean has given me an appreciation for all the little things I took for granted. What I used to consider "just bush" has now become stunning landscape. The hibiscus has to be the most beautiful flower created, how come I never noticed that before? Or saw how many different shades of blue and indigo make up the Caribbean Sea? We took close to 1000 photos, digital and print, on that trip home. Stay tuned for more pages as I scrapbook my favourites.